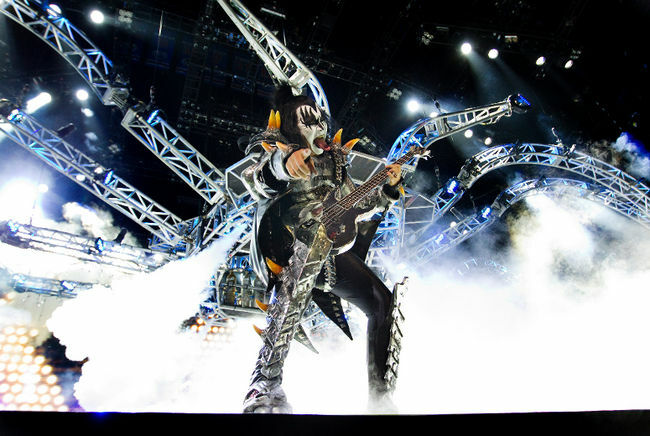 Here’s the thing – KISS still makes an entrance like nobody else in rock and roll. The crowd was volcanic from the start as Starchild Paul Stanley, bassist Gene Simmons and guitar hero Tommy Thayer stepped off the contraption. In the back, Eric Singer, the drummer with the cat’s whiskers makeup and the big hands, pounded away as KISS crunched through Psycho Circus, the 1970s’ hit Shout It Out Loud and Simmons at the mic for Let Me Go, Rock ’N’ Roll. Thayer shredded and posed in the early going. Stanley had his sweet pout working. Full disclosure: These comments are being shaped by rock and roll hero and former Londoner Joe Chertkow, who is at the Bud, too. Back in the day, Joe & I reviewed an early KISS album chiefly by comparing it to bands we liked. Joe noticed we talked about Grand Funk Railroad. Could have fooled me. Being the true expert, Joe reviewed KISS for the Western Gazette in one of their many visits to London in the 1970s. Joe knows. So we’re in good hands & ears. On Saturday, with the pyro and the crazed fans, it was going to be a night at the downtown London arena. The mood was set before the show when a captain in the KISS Army challenged the gents in a men’s washroom at the Bud to shout it out loud. “This ain’t a Justin Bieber concert,” he said. Which was true. Bieber’s fans might not have needed such prodding. Still,when KISS reached the stage via that contraption, the fans were loud indeed even if Simmons had stepped on to the stage gingerly. Must have been those huge platform boots he was sporting. A band as big as KISS needs the biggest in everything, it seems. How big is KISS? Well, once upon a time Simmons said they were even bigger than . . . (pause for gulp of disbelief) Mickey Mouse. “You don’t know how big the image is. By some experts, it is believed to be the most recognized pop culture image on Earth - even above Mickey Mouse,” Simmons said a few years ago to contactmusic.com. Mickey Mouse beater or not, KISS has always been huge in the London and has been a frequent visitor in recent years. KISS was in the region for Sarnia Bayfest 2009 in mid-July, at the then-John Labatt Centre in late September, and back at Bayfest again in early July 2011. It was an incredible crowd, three generations in KISS makeup, Joe Chertkow said post-show. Joe was impressed by Stanley’s role as de facto leader. Thayer had some O Canada for the crowd on guitar – a night after Journey’s Neal Schon had the anthem going at Rock the Park nearby -- and Stanley had his regular zip-lining to send him flying over the crowd. Stanley came up with the line of the night, Joe said.